No one can accuse Sony of false modesty. It claims that the SRS-DB500 2.1 PC audio system launching today will "blow all other PC speakers off the stage." The 300W DB500s also go by the name of 'mu-te-ki', meaning 'invincible' in Japanese. The DB500's "awesome" sonic performance is credited to Sony's S-Master digital amplifier technology usually found in Walkman products and Sony hi-fis. Low-end frequencies are handled by a 150W bass reflex system, with a long-stroke 160mm driver and powerful magnet. Mids and highs are delivered crisply and clearly by two compact satellite speakers, each delivering 75W. Sony claims the all-digital amplification reduces power consumption by up to 85 per cent compared to conventional analogue amplifiers. As an extra touch, the bass cabinet features a built-in 'Deco' lighting effect with three different illumination modes. There's also a remote control and muting mode. 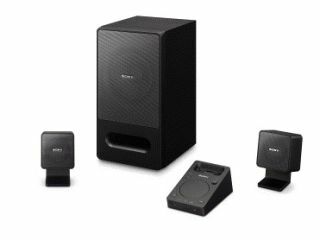 The other IFA PC audio release is the SRS-GD50iP, the first 2.1 PC audio system from Sony to include a dock for iPods and iPhones. The GD50iP is slightly more vincible than the DB500, with a 40W sub and two 10W satellite speakers, remote control and headphone socket. Both systems should be available very shortly.